This was an outstanding day under perfect blue skies. The Watershed turned sharp left, and we followed it SE for most of the day. 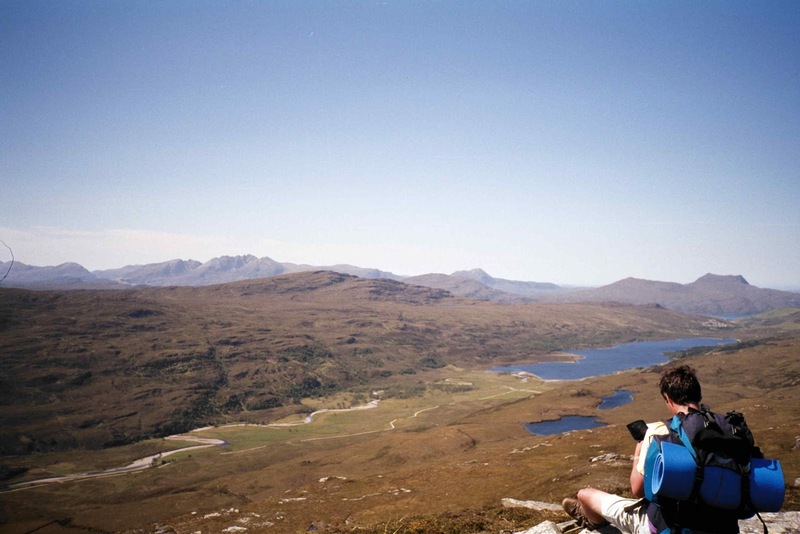 The photo shows our lunch spot on Creag Ruadh looking down over Glen and Loch Achall. The route very satisfactorily followed parallel to its tributaries in Glen Douchary and Gleann a Chadha Dheirg, and we eventually camped exactly at its head - above the dramatic Cadha Dearg corrie (288861). We had reached the summit of Seana Braigh at about 8pm, in wonderful light on a perfectly still and warm evening. One of my top 5 mountain-top experiences.